Sara Rahim, a 2010 NSLI-Y alumna, delivered a keynote address about interfaith cooperation for sustainable development. Sara Rahim, a 2010 National Security Language Initiative for Youth (NSLI-Y) alumna, is the Youth Representative of the Parliament of the World’s Religions. On February 6, 2015, she delivered a keynote address to the United Nations for the World Interfaith Harmony Week. The theme of the event was the role of multi-religious partnerships for sustainable development. “[W]e can use interreligious cooperation and understanding as a vehicle to improve our communities working towards the United Nations Sustainable Development Goals,” she said. The Parliament of the World’s Religions is an interfaith gathering of 50 different religious and spiritual traditions that come together to “share, learn, network and celebrate.” This year’s theme is “Reclaiming the Heart of Our Humanity: Working Together for a World of Compassion, Peace, Justice and Sustainability.” This theme “aligns with the heart of UN World Interfaith Harmony Week,” Sara said. In her speech, Sara recognized the potential for religion to be misused as “an instrument for division and injustice,” but also that when diverse communities “work in harmony for the common good, there is hope that the world can be transformed.” She sees a crucial role for faith and spiritual communities to build sustainable partnerships that can help implement Sustainable Development Goals. Sara also talked about how faith has been an important part of her life and how growing up as a first generation Pakistani American Muslim shaped her values and impacted the way she sees the world and interacts with others. After participating in NSLI-Y and seeing “interreligious cooperation on a global level for the first time,” she “sought a new way of looking at [her] faith identity.” Sara says her Muslim faith is a call to action that has inspired her to serve her community. 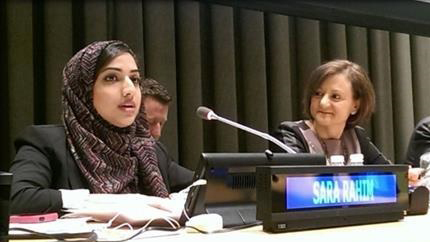 Sara concluded her speech with a call to action, especially in regards to the potential of youth and women: “It is imperative that we bring the voices of young people and women to the table, so that they can be a part of the solution…Passing just laws and creating credible institutions is one of the most sustainable ways to improving development. I envision this as a means of tapping into multi-religious partnerships and collaborating across multiple sectors. The issues that our countries are facing cannot be viewed through a single lens. Access to education impacts the health outcomes of women and youth, which can in turn affect the socioeconomic growth of our communities. The interrelatedness of these critical issues must challenge us to think of new partnerships in innovative ways.